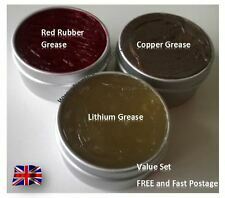 Red Rubber Brake Grease 30g Tin. Generous 30g tin, with enough for al least two complete car rebuilds. Especially designed for brake parts (sliders, rubber o-rings, rubber seals. ). Castrol Red Rubber Grease is a soft red special grease for very specific applications. The castor base oil is thickened with a calcium soap. 20g Castrol Red Rubber Grease. · Castrol Red Rubber Grease can be used on all conventional vehicle hydraulic brake systems utilising DOT 3, DOT 4, Super DOT 4, DOT 4 Plus and 5.1 type brake hydraulic fluids. Castrol Red Rubber Grease is a soft red special grease for very specific applications. The castor base oil is thickened with a calcium soap. Its anti-seize properties are particularly useful when assembly and dismantling occurs. Castrol Braycote™ 3214 is a multi-purpose high-temperature full synthetic grease, which is approved and qualified to MILPRF-32014. - Castrol Braycote 3214 was designed for use in aircraft applications requiring a water-resistant, high-speed, high load arrying capacity grease suitable for use in challenging conditions. This is part is manufactured by CASTROL CLASSIC. Hard consistency grease. High water resistance. Part specifications. Model Number: 15511D. 400ml Castrol Chain Racing Lube. Sold as: 400ml. Size: 400ml. Special anti-wear technology ensures minimal chain elongation and sprocket wear under high load and speed operation. LAND ROVER CASTROL CLASSIC OILS WATER RESISTANCE WATER PUMP GREASE - 500G TUB Hard consistency grease with high water resistance and excellent sealing properties. Also ideal for protecting brake pipes and fittings. **YOU ARE BUYING 1 X 500G TUB** PART NUMBER - DA1595 Manufacturers part numbers are used for identification purposes only. PLEASE READ OUR WARRANTY, RETURNS DELIVERY TERMSBEFORE BUYING. HIGH TEMPERATURE GREASE. We accept all major Credit and Debit cards. We will not accept responsibility for parts ordered incorrectly. Panther Silicone Hoses & Tubes. Oils & Additives. Motorbike Tyres. Part Number: 1610. Hard consistency grease. High water resistance. Office & Industrial. IT & Computing. Outdoor & Leisure. Car Care & Accessories. Automotive Parts. CASTROL CLASSIC OIL WATER GREASE. LAND ROVER. WE ARE HAPPY TO HELP YOU. HARD CONSISTENCY GREASE WITH HIGH WATER RESISTANCE AND EXCELLENT SEALING PROPERTIES. ALSO IDEAL FOR PROTECTING BRAKE PIPES AND FITTINGS. L'olio di ricino base è ispessito con un sapone di calcio. · Castrol rosso gomma grasso utilizzabile anche in applicazioni dove è necessaria la lubrificazione naturale o componenti in gomma SBR. 20g Castrol gomma rosso grasso. Kugellagern als Lebensdauerschmierung einzusetzen. Castrol LMX Li-Komplexfett 2 Hochdruckfett 300g. hohe Leistungsfähigkeit bietet die Voraussetzung, Castrol LMX auch bei thermisch hoch belasteten und schnell drehenden Wälz- und. Neue Produktbezeichnung: Castrol Molub-Alloy Paste TA. auch im Nassbereich gegen Festbrennen, Verschweißen und Verzundern. Temperatureinsatzbereich -40°C bis 1100°C. Bezeichnung früher: Castrol Optimol Paste TA. The water resistance and low temperature pumpability of lithium complex greases is also better than normal lithium soap greases. For these reasons, lithium complex grease find wide acceptance for virtually all grease applications in industrial and automotive markets. Wir beraten Sie gerne! - Gebindeart :Tube. DAS FOLGENDE SET BEINHALTET. Castrol Greentec Bike Cleaner ist ein speziell für Motorräder und Scooter entwickelter Reiniger. Bereits nach kurzer Zeit kann mit klarem Wasser abgespült werden, wobei die anschließende Trocknung durch einen wasserabweisenden Effekt beschleunigt wird. Up for sale is 1 JAR 18 g Castrol Red rubber grease. Brake caliper pistons;. Premium quality automotive grease for use in hydraulic systems – especially braking systems. Compatible with natural and synthetic rubber seals. La graisse Castrol de caoutchouc rouge est une graisse spéciale rouge douce pour des applications très spécifiques. L’huile de ricin de base est épaissie avec un savon de calcium. Graisse de caoutchouc rouge Castrol assure la compatibilité excellente et est non préjudiciable avec naturel et caoutchouc SBR, tout en assurant la bonne résistance mécanique de stabilité et de l’eau.